The first one (on left-side) uses the default split, called vertical split, and the second one (on the right-side) is called horizontal split. 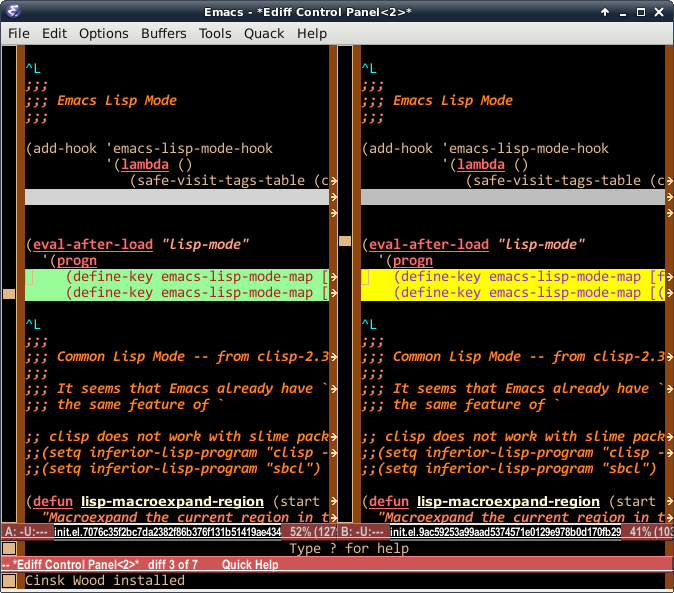 You can switch back and force using | or M-x ediff-toggle-split command in the ediff control buffer. As you can see here, the horizontal split looks much more readable. One problem, though. 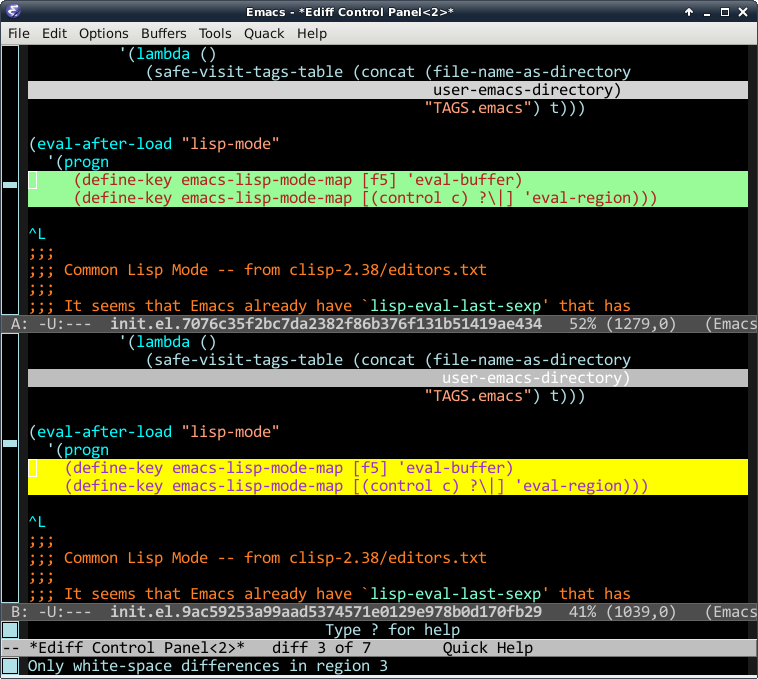 Normally, I uses 80 character width for a emacs frame. If I choose to use the horizontal split, it automatically split the windows in the 80-char-width frame, so that each window will have about 40 characters. (Actually, depending on the width of the scroll bar and the internal borders, it will be smaller than 40 characters). Around a couple of years ago, I wrote custom hook function to automatically widen the frame on the "horizontal split" and restore to the original frame width when ediff session finished. What makes me to feel stupid is, Ediff has already provided that feature years ago. If you use m or M-x ediff-toggle-wide-display on the ediff control buffer, the frame width will span to that of the display. As you can see, this is unacceptable. So, again, I need to modify the configuration little bit, so that it will widen the frame in a reasonable amount. Normally, most people prefer 80 character width for a window. What about 80 * 2 = 160 for the widened frame? — No, using hard-coded value is always a bad choice. Each buffer can have its own fill-column value, which is 70 by default. What about to use fill-column * 2? — No, probably using the previous width of the windows is the better. Ediff provides 2 way diff or 3 way diff job. Merely doubling the width is not good. Depending 2-way-diff or 3-way-diff, I might need to multiply by two or by three. In any case, user might want to use specific width. It will be handy, if m command can have prefix value for the exact width of the window. For example, 160m will set window width to 160, so that total frame width will be 160 * 2 = 320 character width. "Construct an alist of parameters for the wide display. Saves the old frame parameters in `ediff-wide-display-orig-parameters'. The frame to be resized is kept in `ediff-wide-display-frame'. This function modifies only the left margin and the width of the display. It assumes that it is called from within the control buffer." ;; ensure that the frame will be inside of the display border. You may also want to register above function (lambda () ...) in ediff-suspend-hook if you want to restore the frame on ediff suspension. If you want full source, check out my github repository.